While you have the food processor out, why not make a batch for the freezer? 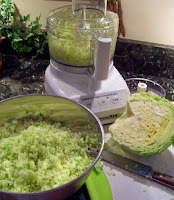 I didn't know you could freeze cole slaw until I read a vinegar based recipe at Elizabeth the Merry Rose. Won't that be a quick picnic dish to make in bulk? Throw a frozen Ziploc full in a cooler, and you'll have cold, crisp slaw by lunchtime. Hmm--that would be a good idea here, because I'm about the only person who will eat more than a spoonful of coleslaw at a time, and who wants to grate just enough for one person? Thanks!